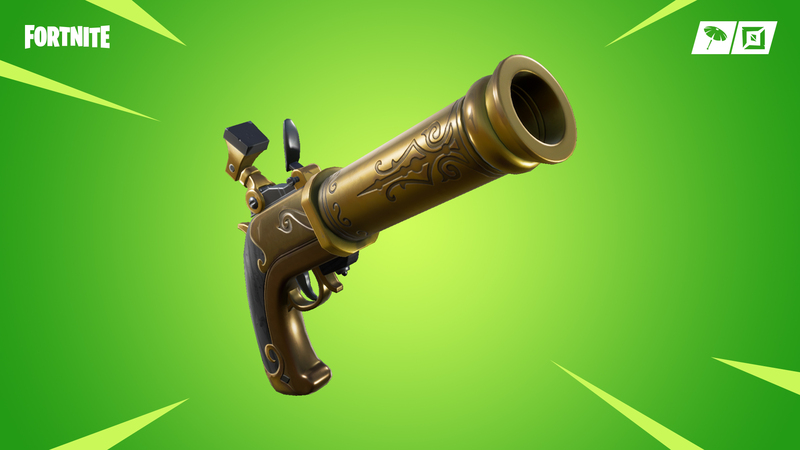 Its been a hot minute since Fortnite developer Epic Games decided to introduce a brand new weapon for Battle Island regulars to get their hands on, but that dry spell ends today. Among other new content that we’ll get into shortly, patch v8.11 is now live and marks the arrival of the so-called Flint-Knock Pistol. As per the official patch notes, this new hand cannon is available in both Common and Uncommon rarities and can only be found as Floor Loot. Of course, the introduction of a simple pistol might seem like a rather unremarkable event to get excited over, but this bite-sized blunderbuss boasts some unique properties. First and foremost, users will need to be aware of the gun’s unwieldy nature. Firing the Flint-Knock from a standing position will result in some hefty recoil for the user, a sizable drawback that can be negated via the simple act of crouching before pulling the trigger. As a close-range weapon, any target that happens to be on the business end of the barrel will be knocked back, too, with distance travelled being dictated by proximity. Keep in mind, however, that significant damage falloff will occur at extended ranges and that the powerhouse requires a 3-second reload after every shot. Those all sound like hefty drawbacks but as a heavy weapon, I expect nothing less. As for the remainder of new and returning content accompanying v8.11, Epic has once more decided to re-open the Fortnite Vault to bring back two weapons: the Impulse Grenade and Scoped Assault Rifle. Additionally, the recently introduced Baller vehicle has had its spawn frequency slashed in half. Finally, new limited-time mode, One Shot, is now live, eager to provide some uncanny fun for those looking for a change of pace from the usual battle royale format. Low Gravity, snipers only and limited healing are the modifiers for this particular LTM, which promises to be a rollicking good time. Enjoy!